My husband chuckled as we walked onto this catamaran. After years of brokering catamaran sales, it was our turn to look at a vessel with the option to buy it or not. We walked into the spacious salon and off I went to peek in the galley, opening little drawers, next to sit on the settee to see how comfy it was, then the heads and the beds… Does this seem familiar? A woman’s and man’s perspective of whether a boat is ‘good’ depends on very different things – we look at pillows, they look at engines; oven – sails; trampoline – anchor; deck seating – helm station etc. It’s just the way it is. When we can appreciate what the other will be focusing on and what is important to the other, the easier it will be to agree on the perfect boat, keeping both parties happy. Solved. Over the years of boat sales, I can recall many times where the wife did not like the ‘feel’ of a boat, or the smell, or the color scheme, and no matter how much equipment that boat had on it, the sale did not happen. My advice to a man: always take your wife with you shopping for a catamaran and listen to her, and if you can find a boat that she’s happy with, get it. You can always add equipment afterwards. Experience has proven that if the wife is not happy at the beginning, chances of selling the boat in a few months, is a high probability. My next bit of advice is to go on a charter together on a model that you both like. That will be the clincher one way or another. 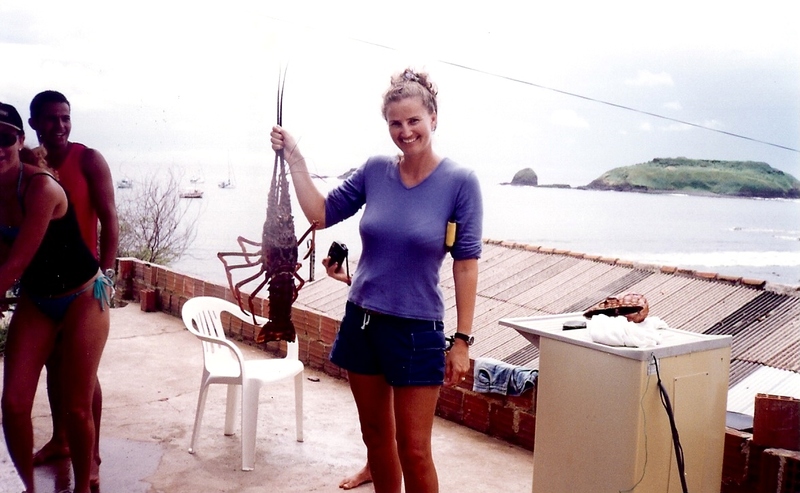 Kent, my husband, and I wanted to do something together before we settled down to have children. One of those options was to sail across the Atlantic. We got accepted as crew onboard an Admiral 38 Catamaran. We packed up all our stuff into storage, got onto the boat and off we went. 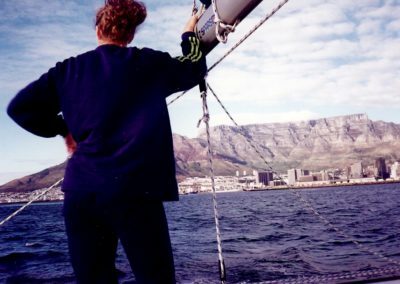 I had never been sailing before we left Cape Town to help deliver this boat, so did not know what it felt like to sail. Kent had all the sailing experience and we were part of a four-crew delivery. I wasn’t too worried. It was thrilling to watch Table Mountain slowly slip off the horizon. We sailed over what seemed like hills in the sea – up and over the rolling hills. The feeling of moving over the sea was amazing until the feeling went to my stomach. I had to lie down and let the fresh air wash over my face. 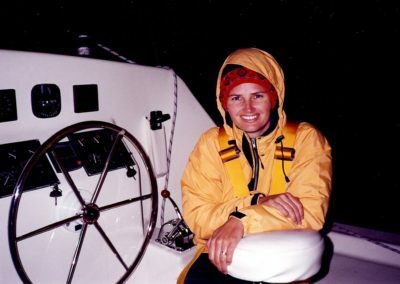 It is my opinion that if the only experience that I had of sailing was those first three days of our transatlantic, I probably would never have sailed again. Period. I was sea-sick for three days and teetering on the brink of possibly needing medical assistance, when I came out of it! It just stopped. My ‘sea legs’ became stronger as we travelled on. There was only one other time on the eight-week trip where I felt sea-sick for a couple of hours while we sailed through some ‘lumpy seas’, as they call it. But once we were through that, and the movement normalized, I was fine again. Had I been given the opportunity to jump ship during those three days of being sea-sick, I probably would have, and never looked back. 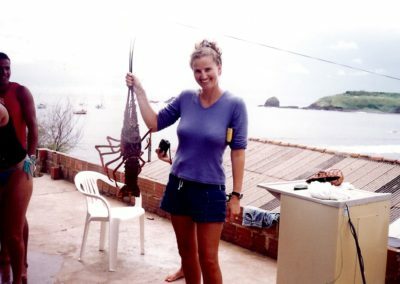 But, I would also have missed out on what was probably one of the highlights of my life – travelling across an ocean with my wonderful husband – an adventure that broadened my horizons in more ways than one. Of course, everyone’s experience of sailing is different. 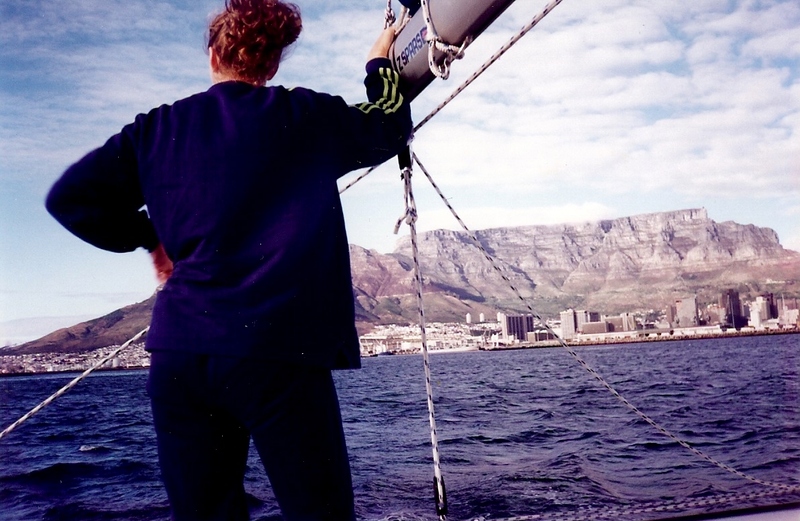 My sailing experience was that, after being out at sea for two weeks, all the business of life slowly seeped out. Little by little, issues, or things I had buried for various reasons, all took their turn to surface. Having this time allowed the distractions of life to filter out. My inner self started to breathe again and it was so good to meet parts of myself that I had forgotten or pushed aside because of time constraints. Quite frankly, this experience of being out at sea for eight weeks is something that I think we should all do every five years or so – taking the time to scoop off the muck that blurs our vision and dampens our spirits. I found creativity begin to well up inside me. I wanted to write and draw and paint. It was wonderful. I felt like I connected with myself again, with the things that make me, me. Of course, the actual experience of sailing was also amazing to me: moving through the ocean, watching the sunrise over an endless ocean, the fluorescence churning in the dark ocean waters leaving bright trails matched only by the bright milky way above, all this shared with Kent drew us closer than before…I can go on and on. 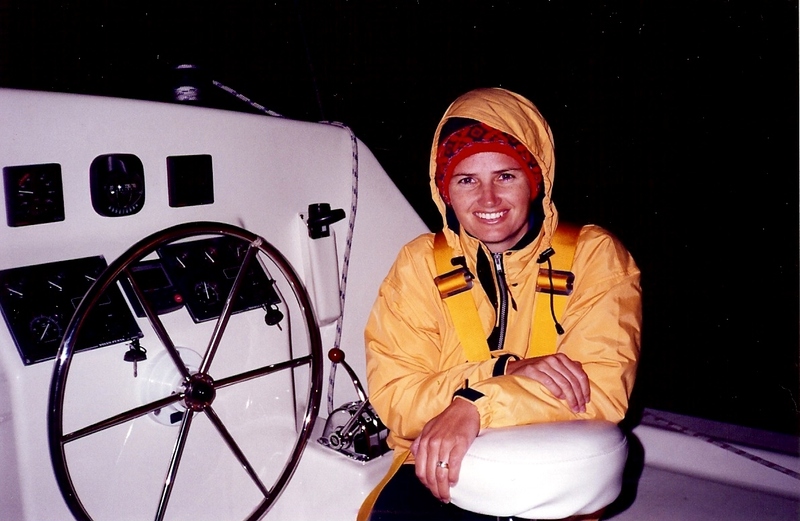 For other women, the sailing experience could be discovering something new or, as with myself, reconnecting with the things that had been buried or forgotten. Maybe for you it’s cooking, meeting new people, blogging, photography or simply the opportunity to draw closer to your husband, your family…making memories that money can’t buy! My advice to women who are about to embark on their catamaran experience: give yourself the opportunity to discover yourself again. Give yourself time to adjust to the sailing experience and then be prepared to be surprised. Leaving the comfort of home and familiarity may seem scary, but give yourself, and sailing, a chance – don’t write it off after a few bad experiences (and believe me that can range from the fact that you can’t find a fresh lettuce on an island, to dealing with the panic of dragging anchor in the middle of the night in harsh weather, or being sea-sick) …just give it a chance.